WICHITA, Kan. (Aug. 20, 2013) – Beechcraft Corporation today announced the completion of the inaugural flight of its first production Beechcraft AT-6 light attack aircraft. The company commemorated the event at its headquarters in Wichita, Kan., with employees and dignitaries. 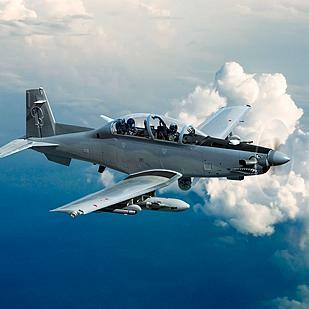 With more than 1,600 hours already logged in AT-6 test aircraft, Beechcraft is offering the AT-6 to U.S. partner nations in need of light attack air support for the most demanding scenarios. This entry was posted in Archived and tagged AT-6 light attack aircraft, Beechcraft. Bookmark the permalink.